Many prayers of those who prayed in the monastery temple were heard. Many were given healing from illness, when their prayer for health was read near the relics of the Holy Prince Lazar. Many have hidden this grace of God in their souls and did not tell anyone. We record only some cases, in order to celebrate the name of God and the evidence that the wonders of God are taking place in our time. Immediately after the arrival of holy relics to the Ravanica Monastery in 1989, parents from the village of Svojnova brought their paralyzed child and placed them beside the relics on the floor. The child was lying all the time while prayer was read and the Holy Liturgy served. Next week they came back with a child who was already walking. As they live abroad, whenever they come to Serbia they glorify the Holy Prince Lazar. Radosav and Olgica Lazic from Jagodina brought their grandchild in their arms, 3-4 years old, with a strong temperature that doctors could not cure. They came to the relics of the Holy Prince Lazar and the nun said to them to lean the child’s head on the reliquary and covered his head with a blanket. After praying, the fever was gone. They went home with great joy, thanking God and the Holy Prince Lazar. 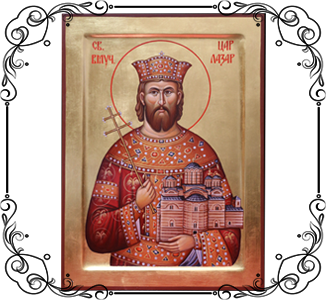 Nenad, a devious young man from Negotin, healed himself near the relics of Holy Prince Lazar, after the prayers of O. Damascus, who was then serving in the monastery. Before that, he often screamed out screams of various animals in his illness. After the prayer, he went home completely healed. At Christmas 1994, as we were told by girl S. S. from Paracin, she suffered a lot from demonic forces. 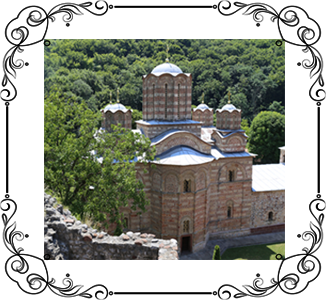 She came to Monastery Ravanica, where she prayed near the coffin of the Holy Prince Lazar. When she went home, she vomited a long time, after which she completely recovered. Pava Djisic from Zajecar, was in the monastery of Ravanica in 1993. On the day of Sv. Emperor Constantine and Jelena she had severe pain in her legs and she was not able to move. Her prayer was read, and she says, she also prayed herself. Upon returning home, the pains began to decrease, until it completely disappeared. To thank Prince Lazar, she created a large bedspread for the reliquary and three stalls in the church. After healing, she was visiting the Monastery every year and helped the sisters in the work.